Hey there researcher! 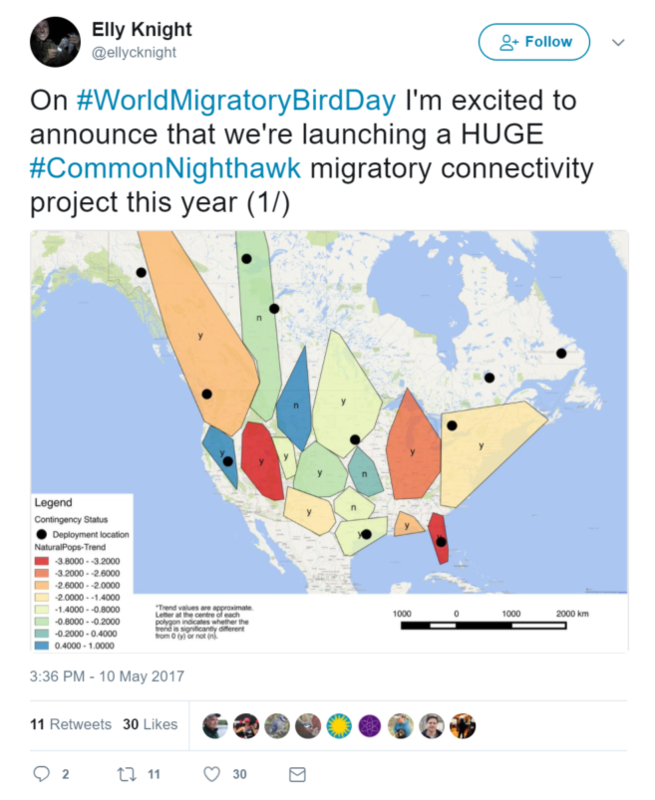 So, you’re interested in using Twitter to advance your science or science communication. Well, you can breathe easy because do we have some guidance for you. This guide assumes that you have no knowledge or experience with Twitter. If do you happen to have used Twitter before, feel free to skip Part One (getting set up with Twitter) and Part Two (the basics of using Twitter). One other thing – this guide assumes that you have read our Audience First module. So, do take a look if you haven’t already. With Audience First, you’ll get a handle on your communication goals as well as on how to reach them. It’s important to think through these kind of things first, as it will really inform how you use Twitter. Go to twitter.com and hit the sign up button. As you sign up, Twitter will ask for your name and username. Do note that you can change almost any aspect of your Twitter presence, except for one thing: your username (that is, your Twitter handle). So, please be sure that you are satisfied with your username before you register it. So, what kind of username should you pick? Should you pick one that directly refers to you or your organization? Or are you better off with something more anonymous? Should you provide your real name? The answer to these questions really depend on your communications goals (which you have got nailed down, thanks to the handsome and dashing Audience First material). Generally speaking though, if you’re trying to build some kind of direct connection to a potential audience, you’re better off using a name/username that isn’t anonymous. During the sign up process, Twitter will ask you for a photo. You should definitely add one, as replacing the default image (below) will make a huge difference in humanizing your account. If you’re planning to tweet as yourself or as part of an organization (that is non-anonymously), you should use an image that conveys something about you (a headshot, perhaps?). If you’re planning to tweet anonymously, it still makes sense to use that meaning-conveying image (skip the headshot). Multiple other questions for your profile will then be asked by Twitter that you can choose to answer or not. Twitter will also ask you to send your first tweet, which you can skip. The one important thing to fill out is the introduction to you (examples shown below). As you can see from these examples, there isn’t just one way to write this introduction, so go with what seems appropriate to you. Three is definitely the charm here. The defining feature of the platform is that any individual tweet can only be a maximum of 140 characters (though there are ways that people get around this, see below). There are a few exceptions to this character limit, but you’ll be surprised at how much you can do even with such a space constraint. 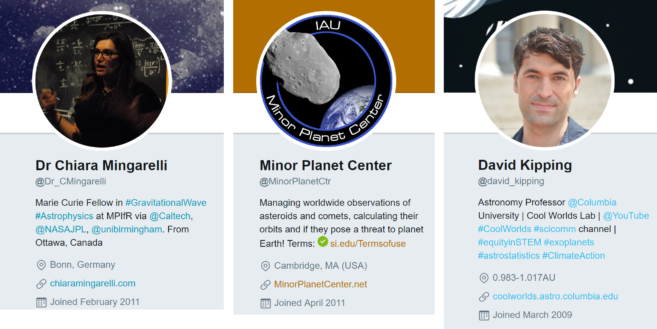 An ampersand followed by any set of characters refers to someone’s Twitter handle (for example: @MinorPlanetCtr refers to the Minor Planet Center). Think of this as the Twitter version of an e-mail address. If you use someone’s Twitter handle in a tweet, that person will be notified that you did so (though some people, particularly those with very active Twitter accounts, turn those notifications off). At the bottom left of the tweet above, if you look closely, you’ll see three gray icons. The leftmost icon (the chat bubble) stands for reply – specifically for replying to the person that sent the tweet. You can think of a reply in Twitter as being very similar to an email reply – with one big exception (your Twitter replies are public, like the rest of your tweets). You’ll notice a number to the right of the reply icon (in this case 2), which refers to the total number of replies this tweet has received. The center gray icon (two arrows pointing at each other) stands for retweet. If you retweet something, that means you are reposting a tweet that you came across to all of the people who follow you. Twitter allows you to just retweet a tweet with the press of a button. You can either retweet something as is or add some commentary to that retweet. In the latter case, only your commentary counts toward the 140 character limit. Exactly as before, the number next to the icon refers to the number of times this tweet has already been retweeted. The heart icon on the right stands for like. A liked tweet is not retweeted. Marking a tweet as liked serves two purposes. First, liked tweets are archived as “Favorites” in your profile. Second, you can also use likes to indicate tweets that are meaningful to you, because the person who posted the tweet will be notified of your like, and other users can see the number of likes associated with an individual tweet. If you provide a link to an image, video, or practically anything else on the Internet, a snapshot of that thing will directly show up with your tweet. Twitter will automatically provide a shortened version of the link. However, you have the option of uploading images and videos directly to Twitter, which also don’t count towards your character limit. You can see where you can upload these things in the image below. The four blue icons in the lower left respectively refer to: 1) upload a photo or video, 2) upload a gif (which in this case means a simple animated image, like these), 3) create a poll, and 4) provide your location. A hashtag is a keyword that you add to your tweet. You can make anything a keyword: just put a # before the word. The key reason to use a hashtag is that everyone who is paying attention to a particular hashtag will automatically see all of your tweets that use that hashtag. So, for example, if you include #SciFundIsTheBest, everyone who is keeping track of #SciFundIsTheBest (that is #SciFundIsTheBest-related conversations) will see that tweet. Note that capitalization doesn’t matter. #SCIFUNDISTHEBEST, #scifundisthebest, and #SciFundIsTheBest are all equivalent. Hashtags are most commonly used as a way to connect people who are having a Twitter conversation about a particular topic. One of the key features of Twitter is that it is very much of the moment. Generally speaking, you will only see what the people you follow are posting right then, and the people who follow you will similarly see only what you tweet in the moment. However, this doesn’t mean that your past tweets vanish. A record of all your past tweets remains, which anyone, not just the people who follow you, can access. Remember though that you can always delete your tweets. There are several consequences to this. The first is that Twitter is a very public medium. As a result, Twitter is a great place to have public conversations, as well as to engage and build initial connections with people that are not familiar to you — think of it as the poster session at your annual conference. Twitter is a place that you can share information, meet new people, but also be overheard by lots of other people. Twitter is essentially fixed in the permanent now, a place where real-time conversations among people (who may not even know each other) can occur. The real-time nature of Twitter means that, if the people who follow you are not checking Twitter when you post a tweet, they generally won’t see it unless they look through the record of your past tweets. While some people do use Twitter this way, most don’t. This means that it is not considered problematic to say the same thing multiple times or to share a particular link more than once. If you want to get more eyes on an op-ed you wrote, for example, you might share it once a day for a week, with different titles or with an “ICYMI” (in case you missed it) appended. You can also “pin” one post to your feed, such that it’s always on top when people click through to your profile. Pinning is good for, say, a tweet about your latest publication. Tweets from the awesome astrophysicist Katie Mack. Note that the tweet at the top is “pinned” – it hails from way back in 2015. Just because tweets are flowing by in a never-ending stream doesn’t mean that you are expected to keep paying attention to it! Think of it as a 24-hour news channel. You watch whenever you happen to watch. Whatever you missed when you were not watching is not something to worry about. Besides, you can always search, check hashtags, or use the Live or Trending tabs to catch up. Who notices your tweets? Although anyone can look through your old tweets, that’s probably not going to be the main way that people see your stuff. There are four basic ways, which are mentioned briefly here and covered with greater depth below. The first set of people who see your tweets is your followers (assuming they are on Twitter when you post). The second set are people whom you are in conversation with, using something called hashtags. The third set are people who see your tweets because they were reposted (or retweeted) by someone that those people follow. So, for example, if several people retweet something you tweet, all of their followers will see your tweet as well. The last set are people whom you specifically refer to in your tweet. There is one component of Twitter that is private — direct messaging (otherwise known as DM). You can think of direct messaging as a private conversation between two people. Unlike a regular tweet, DMs don’t just vanish down the endless river of tweets. The recipient will be notified that they have received a DM the next time they check into Twitter. You can send a direct message to one person or a group. You can’t just direct message anyone you want. Generally speaking, a DM only can be sent to someone who follows you (though there are exceptions). Some account holders, though, allow anyone to DM them. Be sure to check your Twitter settings and indicate your preference for receiving DMs and other notifications. Though you are definitely encouraged to keep within the 140 character limit per tweet (less is almost always more), sometimes you just need more space. There are two main ways to do this. The first way is to write multiple tweets on whatever it is you want to talk about. There are multiple ways to signal that the tweets are part of a series, but the simplest is to just number them (so the second tweet of the series would be: 2. your message). An approach that is a much more traditional way to use Twitter is to provide a link in a tweet which provides a longer statement on whatever topic is at hand. One twist to this method that has become increasingly prevalent is to attach a screenshot of a written statement directly to a tweet. This approach is most commonly used to distribute press releases. The way it works is to prepare some sort of written statement, of whatever length, and save it as an image. If you link to that image, the entire written statement will be attached to whatever tweet it is linked. You have looked through our exciting and elegant Audience First module right? Great, you now have at least an initial sense of your audience is and why you want to talk to them. You also know that you need to frame your message within the context of your audience’s current interests and concerns. But how do you know what those are? Fear not because Twitter is a great way to figure it out. All you need to do is to find your people on Twitter and then pay attention to their tweets. Simple, right? Well, maybe not quite so simple. Let’s break it down. Running into your audience on Twitter can seem like finding a needle in an ocean of haystacks. We have some suggestions though that will give those haystacks a run for their money. The goal here is to come up with ten or more relevant Twitter accounts. This is likely going to take you some time – you’ll probably need to break this audience-finding business into multiple sessions to preserve your sanity. 1. Is there a prominent person or organization you can think of who is connected in some way to your target audience? If so, search to see if that person/org is on Twitter (the Search box is in the upper right if you are on twitter.com on your desktop, while on the Twitter app the equivalent Explore icon is located bottom center). 2. If you read through the tweets of that person/organization, do you notice any Twitter accounts being referenced? Those accounts may well be in your target audience. 3. On a similar line, when reading the tweets of a person in your audience, do any hashtags pop up? Searching for these hashtags could lead you to yet more people in your target audience. 4. Of course, you can always just search directly for hashtags that you guess might be in use with your target audience. It may take some trial and error to circle in on the right hashtags. Please note that Twitter gives you the option of “top” or “latest” when you are searching for terms – you generally want to use “latest” (see image below). Searching for the latest tweets for the 2017 meeting of the Ecological Society of America. 5. After all this, are you still having trouble finding people in your audience? Well, you can turn your frown upside down, because your Result Zero is actually a valuable piece of information. You might be having trouble finding your audience, because your audience (as you have defined it) doesn’t exist. Perhaps you defined your audience too narrowly. Perhaps, what seemed at first glance to be a cohesive audience actually describes a set of people who have very little in common (and are consequently hard to search for). 6. With this audience tracking stuff, one thing to do is to filter out accounts that are promotional in nature. The trouble with these kinds of accounts, even if they are in line with your audience, is that they often don’t give you an accurate sense of what your audience is thinking (they’re more about selling you something at 10% off). Once you have an initial set of Twitter accounts with which to pay attention – well, start paying attention! With this infinite length focus group of yours, you have the opportunity of keeping a continual finger on the pulse of your audience. As you keep an eye of your people’s tweets, do you notice any interests or concerns that seem to bubble to the surface? Do note that these interests/concerns don’t need to be directly connected to your science. Do certain hashtags come up frequently? The point of this process is to give you insight – insight into your audience that you’ll need to get them to pay attention to what you have to say. Do keep in mind that this audience-insight/tweet-monitoring business is unlikely to be instantaneous. The more time you keep an eye on things, the greater the insight that you’ll likely have (it’s hard to get to enlightenment on the express bus). Once you have your audience pegged (at least sort of), what happens next? Well, it really depends on your overall goals. If your major goal is to monitor what’s going on with a group (say, keeping track of the papers found interesting by people in your field), you don’t need to go any further than this. Keep reading those tweets in good health! However, if you need to engage your audience in order to take home the gold, more steps are needed. To have your audience pay attention to your messaging, the key is conversation (not monologue, which is generally unhelpful unless you are doing Shakespeare). What does conversation mean in a Twitter context? Most of the time, it means hashtags. Due to your eagle-eyed audience monitoring, you’ll know what hashtags are in current use by your people (and hence what topics are on the top of their minds). Can you find a way to add to an ongoing conversation that is tied together by a hashtag? How can you bring up your science message within the context of that hashtag? There is a secret Twitter tool that only a select few know: lists. It’s a bit surprising that they are so little used, because they are among the most useful features that Twitter has to offer. What does a list do? Well, wouldn’t it be great to be able to see all of your audience’s tweets in one place, rather than having to check each account separately like a dope? That’s what lists allow you to do. With lists, you can group together in one place all of the accounts that connect to any given audience or topic. Do note that you can’t really use lists on the mobile app (you’ll need the desktop version of Twitter). All of this might seem rather abstract, so let’s go with an example. Let’s return to the awesome astrophysicist Kate Mack (@astrokatie) who happens to have created her own list of women in physics, astronomy, and related areas. Below you can see a very partial listing of the people that she added to this list. By the way, you can see if someone has created any lists, by checking out that person’s Twitter home page (all the way to the right in the image below). So, how do you create your own list anyway? The first step is to click on the small version of your profile picture in the upper right of your own Twitter screen (you’ll need to be logged in for this to work). In the menu that appears, select Lists. The upper right of your twitter screen (except that you’ll see your own profile picture and not Katie Mack’s). In the Lists page that appears, look for the Create a List box (its precise location on the page depends on your screen, but it looks like the image below). Hit Create New List. The following screen will let you name your list as well as select whether your list will be private or public. This privacy setting actually matters! A public list is visible to everyone and anyone added to such a list will be notified that this has happened. A private list is visible only to you and those added aren’t notified. Congratulations! Your list is now ready to go. Now all that you have to do is to add in Twitter accounts, which is simplicity itself. On the home page of an account that you’d like to add, look for three vertical dots to the right of the screen (to the right of the Follow button). If you click on those dots, the ensuing menu will allow you to add that account to a list (see image below). Once you have created your list, how do you keep track of what’s going on there? Well, let’s go back to your own Lists page (hit the small version of your profile picture in the upper right of the screen). Here, you’ll see all of the lists that you have created (public and private). If you click on any of the lists, you can see both the members of the list as well as their combined tweets. Easy peasy. 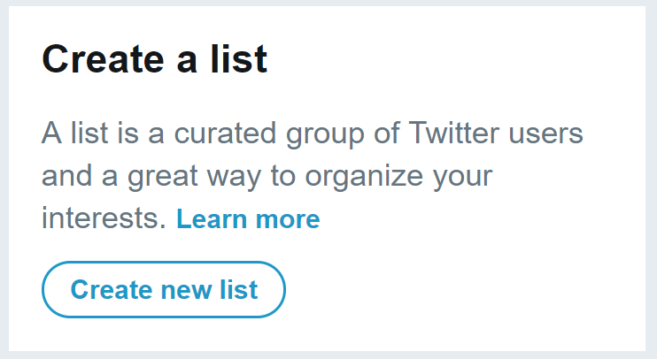 Okay, you are now effectively connecting with your audience, making lists left and right, and are generally crushing it on Twitter. Are there any more worlds to conquer here? Why yes – there are. If you use Twitter a lot, you’ll probably be keeping track of many things, such as: your own feed, various lists, myriad hashtags, the tweets of a specific person, and so on. Wouldn’t it be great if you could see all of this on one screen, instead of having to switch back and forth between everything? Well, it turns out you can – if you use an app that allows you to manage social media accounts. There are several popular apps out there that do just this. Let’s get you up to speed with one of them: Tweetdeck. 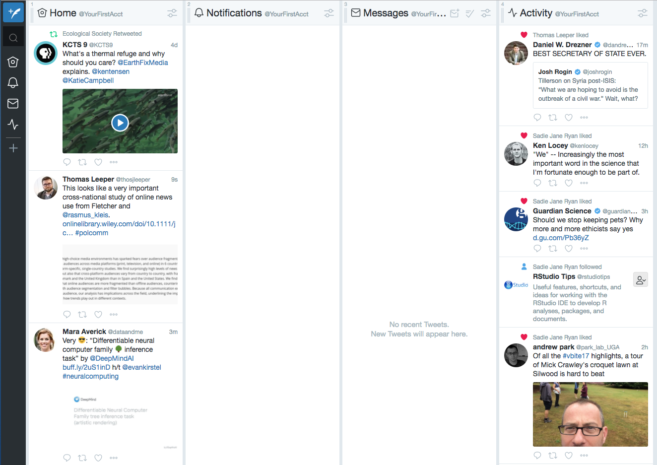 Tweetdeck is free and you can get to it on your desktop browser (Tweetdeck really generally work well on the small screens of mobile devices). It has the additional advantage that you don’t need to sign up for yet another account, since Tweetdeck is run by Twitter itself. Anyway, here it is: tweetdeck.twitter.com. The key idea with Tweetdeck is that everything is organized by columns. A single column can be many things: a list, your feed, a hashtag that you’re following, or practically any other type of information that exists in Twitter-land. As an example, let’s take a gander at the image above to see the columns that you’ll start out with. If we ignore the black column all the way to the left for the moment, you can see that there are four columns which (from left to right) are: Home, Notifications, Messages, Activity. The Home column shows your feed (that is, the tweets of the people that you follow). Just as you are used to, the tweets will scroll down as new ones pop up (this static image can sadly not be commanded to move). Notifications shows anything new that has happened with your account (such as getting new followers, new retweets, and the like). Messages shows – very surprisingly – direct messages to you. Activity shows all of the things that the people you follow are doing. 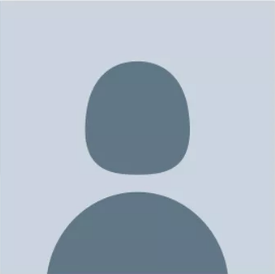 Your eagle eye may have noticed that Notifications and Messages are blank – that’s because this particular account was set up specifically for this illustration (meaning no one has followed it, no one has messaged it, no one has retweeted any of its nonexistent tweets, etc.). Notifications and Messages will likely not be blank for you. The great thing about columns is that it is very easy to add, move, and remove them. To do that though, we’ll have to first talk about that black column all the way to the left. You can consider this column to be something of an overall control panel for Tweetdeck (and Twitter as well). For the purposes of this guide, we’ll be just focusing on the top half of the column, which is below. The top blue icon allows you to send tweets directly from Tweetdeck. We’ll skip the next magnifying glass icon (which stands for search), because that functionality is replicated further down on this column. The next four icons (the house, bell, envelope, and line) respectively refer to your four columns of tweets (your feed, notifications, messages, and activity). By clicking on any of these icons, you’ll be taken straight to that column. If you add, move, or remove columns, these icons will change accordingly. This may not seem like much, with just the four columns here, but as you get going with Tweetdeck, you’ll likely add many more columns. 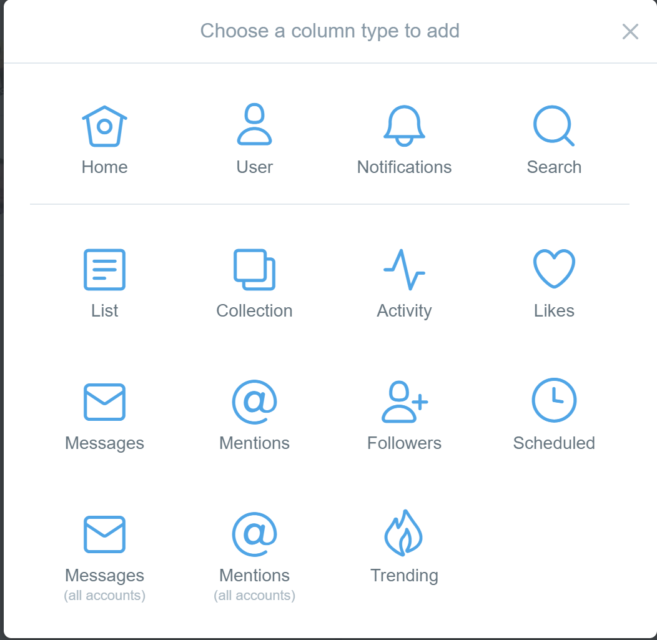 At that point, the icons will hugely help you to navigate between your columns. The last icon below is a plus sign, which is how you add new columns. If you hit the plus sign, what you’ll see is below. As you can see, there are a huge number of possibilities, so we’ll just run over the ones that are probably going to be the most useful for you. In the top row, you’ll notice User, which allows you to have only the tweets of single Twitter account in a column (useful, if that account is important to you for any reason). In the same row, you can see Search, which is likely the most useful option of all. Search does lots of things, but you’ll probably use it most to keep track of hashtags. Search allows you to make any hashtag a column, meaning that every tweet from every user that uses that hashtag will show up in that column. In the second row, the List icon will let you add any of your lists as a column (you can create new lists from here too). In the third row, Mentions allows you to keep track of all of the tweets that mention you. 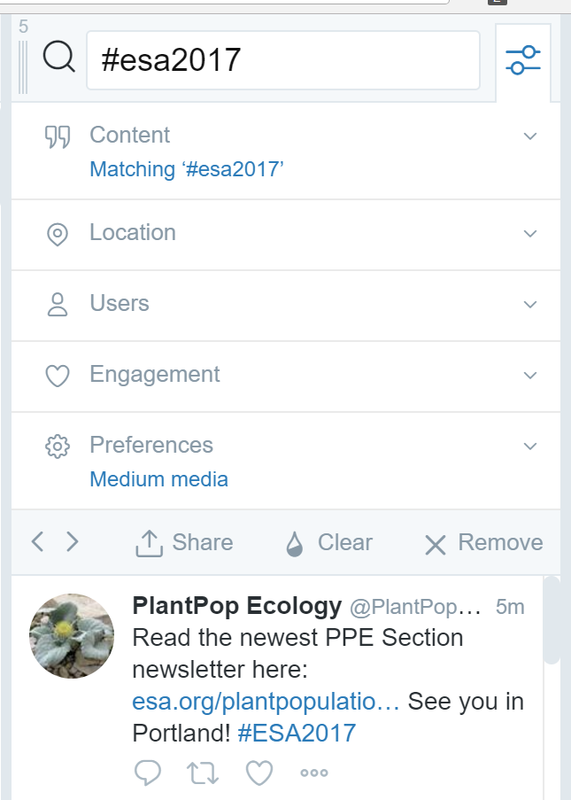 Let’s go ahead and add the hashtag #ESA2017 (which refers to the 2017 annual meeting of the Ecological Society of America) as a column using the Search icon. What results is below (click image for larger view). You’ll notice two things. A column with #ESA2017 has been added to the right as the fifth column. You’ll also notice that, in the black column all the way to the left, a new magnifying glass icon (signifying a search column) has been added at the bottom. If you look super closely, you’ll notice that there is a two-parallel-line icon at the top of each column to the right of the column title. This icon allows you to control, in a finer-grained way, what is going on in the column. Let’s go ahead and hit that icon for our new #ESA2017 column – a drop down box will appear, as shown below. The rows Content, Location, Users, Engagement, and Preferences allow you to precisely adjust what shows up in the column. We won’t be getting into the details of these options here, but please do boldly explore! The most essential functionality of this drop down box is all the way at its bottom. Below Preferences, you’ll see a few icons. The < > buttons allow you to move the column left and right respectively in Tweetdeck. With the Remove button to the right, you can delete the column altogether. So, that’s it: you are now an officially-certified Tweetdeck Master. Congratulations! As you shape Tweetdeck to exactly meet your needs – adding and subtracting columns like a crazy person – you’ll soon find yourself living your Twitter life in a columnized way. Indeed, soon enough, you may just be able to pierce the veil and to see through the Matrix.